Project appears near complete except for modular receivers and parabolic mirrors. 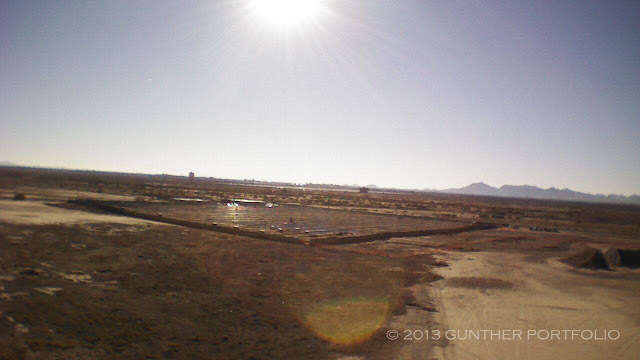 First flight of the solar site survey quadricopter! 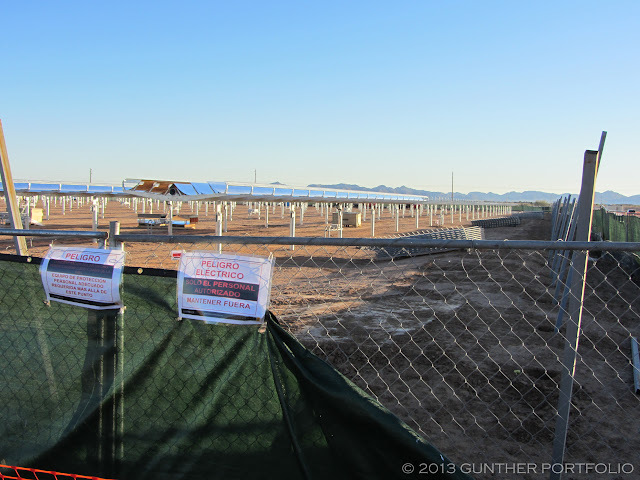 Ever since the SunPower C7 Tracker Update at CPV USA 2012, I’ve considered a visit to Mesa before the project’s expected completion in December 2012. Alas, I opted to change a daytrip into a southwest road trip after New Years. 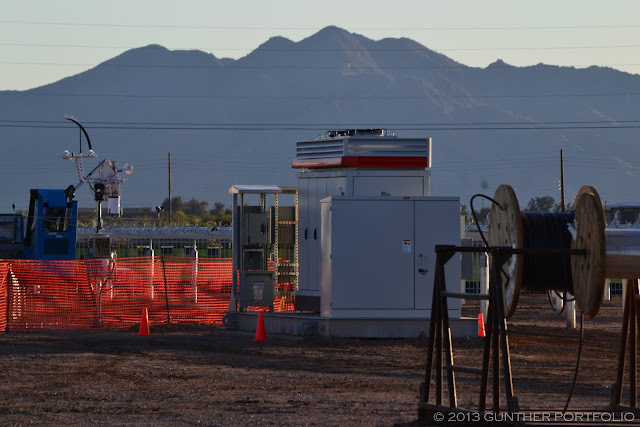 Pensive, I thought SunPower Corporation (NASDAQ:SPWR) would announce the completion of the first commercial 1.1 MegaWatt-peak (MWp) C7 Tracker project at the Arizona State University (ASU) Polytechnic campus before the holidays or at the start of 2013. I was lucky to be wrong. With some effort, I found the project tucked away in the southeast corner of the ASU Polytechnic campus late in the day. I should have reread the original project announcement press release. From a distance, mirrors protruded just above a privacy fence surrounding the site as can be seen in the inset photos. Upon examination, all the trackers appear to be installed along with a central inverter I suspect was sourced from SMA America, LLC, a unit of SMA Solar Technology AG (ETR:S92). 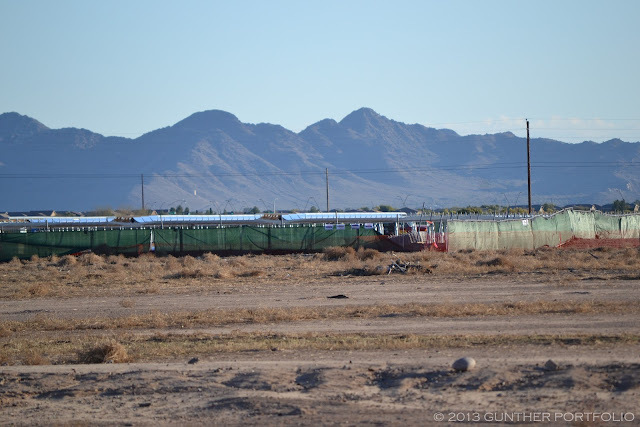 While a number of parabolic mirrors were installed on trackers at the northwest corner of the site, I did not observe a single modular receiver paired with any of the installed mirrors. Also, the tracker sections with mirrors were not following the sun. Although a few boxes were strewn about perhaps containing mirrors or receivers, nowhere near enough were present onsite to complete the project. Of course, further materials could be stored offsite or be delivered just in time. SunPower claims the modular receivers can be snapped into the trackers quickly, and two workers can build out a C7 Tracker in about 1.5 hours. So in concept, a small workforce could complete the project installation of mirrors and modular receivers in a week or two. The headline photo and the video below were taken using my latest solar site survey tool, the Parrot AR.Drone 2.0 Quadricopter. Avoiding the Drone part of the name, I will refer to the contraption as a quadricopter. After all, a $299 list price quadricopter should not be confused with commercial drones or UAVs (Unmanned Aerial Vehicles) at least one to two orders of magnitude more expensive. This is a mere toy, right? The small quadricopter provides the capability of gaining altitude for peering into solar installations where buildings, terrain, or trees are unavailable and overflights are impractical or cost prohibitive. In this case, I should have flown higher and a bit closer to home in on the northwest corner. Please see “Drone journalism set for takeoff – once they’re permitted to use our airspace” by Duncan Jefferies for The Guardian and DroneJournalism.org for background on the use of commercial drones by journalists. I have not contacted SunPower regarding the official status of the ASU Polytechnic C7 Tracker project. As a public company, I did not believe SunPower would respond to my inquiry. I wonder if the project delay was caused by a redesign of the modular receiver or parabolic mirror? Perhaps the decision was made to utilize SunPower’s highest efficiency Gen 3 back contact silicon solar cells? Or did the C7 Tracker joint venture agreement with Tianjin Zhonghuan Semiconductor (TZS), Inner Mongolia Power, and Hohhot City somehow impact the schedule? The delay at ASU Polytechnic could impact the second 7 MWp project for Tucson Electric Power (TEP), a subsidiary of UniSource Energy Corporation (NYSE:UNS), slated to begin construction in the first half of 2013 and the ramp of 50 to 100 MegaWatts of C7 modular receiver capacity touted by SunPower President and Chief Executive Officer Tom Werner last August. 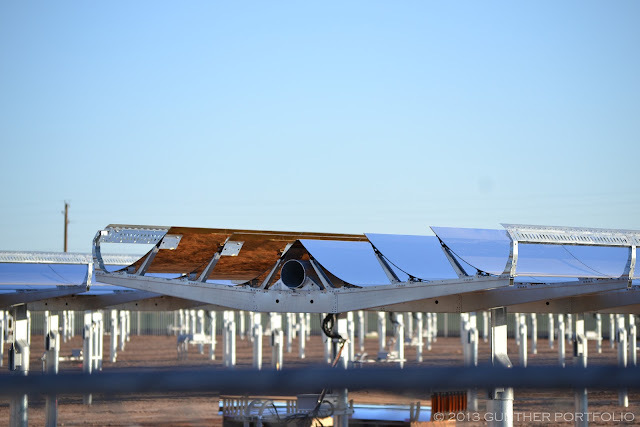 Concentrating PhotoVoltaic (CPV) systems have a history of being harder to implement than expected, maybe even for companies with CPV in their corporate DNA like SunPower. Congratulations to SunPower on the sale of the 579 MW Antelope Valley Solar Project (AVSP) to MidAmerican Solar, a subsidiary of MidAmerican Renewables, LLC. Thanks for your report for C7! Now JV of SPWR and Zhonghuan are building 20MW C7 in China, and claimed $0.066/kwhr cost. This 6.6cent total cost will directly compete with coal electricity. Lots shareholders of TZS(002129 stock list) are waiting for the formal 20mw C7 data in this month. And also TZS claimed 24.5% Maxeon cell with TZS CFZ n wafer. BTW, can you find 6wm TEP in google earth? is it begin to work? Hope we can comunicate about spwr and tzs more in the future.